To better exploit the power of FitnessSyncer, its best to understand some of the concepts used. FitnessSyncer is divided into two configuration items, Sources and Destination Tasks. Activity: All Fitness Information including Activity Tracking, Running, Walking, Swimming, Weight Lifting, etc. The information from the Sources is available on our Dashboard, Stream, Calendar, Daily Analyzer, Your Best, and Destination Tasks. More information is available in the section sources documentation. Synchronization Tasks: Synchronize your health and fitness data from a variety of sources to another service. E-mail Tasks: FitnessSyncer can e-mail you daily, weekly, and monthly health and fitness reports. Social Tasks: Update your Twitter and Facebook feeds with your daily, weekly, or monthly achievements. ShoeRenew: Automatically monitor the wear on your shoes or when to get regular maintenance on equipment. Alert Tasks: Get notified when your data exceeds your configurable thresholds. Refresh Source: A Pro feature to schedule source data refreshes. To synchronize, we copy the items in the Sources to the Destinations. FitnessSyncer does not delete or update any records directly. If the data is not available from a service, it will result in a 0 and in some rare cases, calculated by FitnessSyncer. All destination tasks will be ran by default once per day, usually during the night. 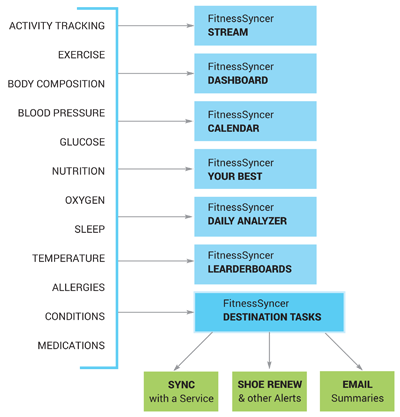 FitnessSyncer Pro subscribers have the ability to run this more frequently and scheduling the tasks.